It's Time to Redeem Your Macy's Money! Shop Macy's Winter Weekend Sale TODAY! You like shopping. You like shopping at Macy’s. You like saving money when you shop. So how can you maximize your Macy’s online shopping? I’m assuming you’ve already read up on my post about How to Save Money at Macy’s when there isn’t a sale, but I’m talking about something much simpler to help you save money online at Macy’s. My account – update your account information, pay your bill, see store events & get special offers customized just for you. Emails – be the first to know about online & in-store sales and Free Shipping events, and get special email-only offers. Text messages – receive special offers and exclusive sales & events on your cell. Address book – securely store the shipping addresses you use most often. Wallet – save your billing information securely and take advantage of speedy checkout. Lists – store your favorite items and let friends and family know exactly what you’re wishing for. After you sign in, you will have access to your Macy’s Wallet, which will make checking out faster and accessing your customized offers even easier. 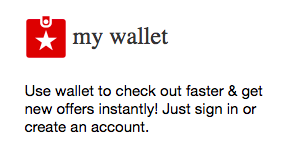 (If you opted not to sign in first, you can still access the “My Wallet” banner from the Macy’s deals page – see next step). The very next thing you want to do in order to save money online at Macy’s is to click on the Macy’s Deals Page. I know Macy’s is great about displaying their latest sale loud and proud on their homepage, but on the deals page you’ll find all Macy’s latest deals in one easy-to-shop spot. 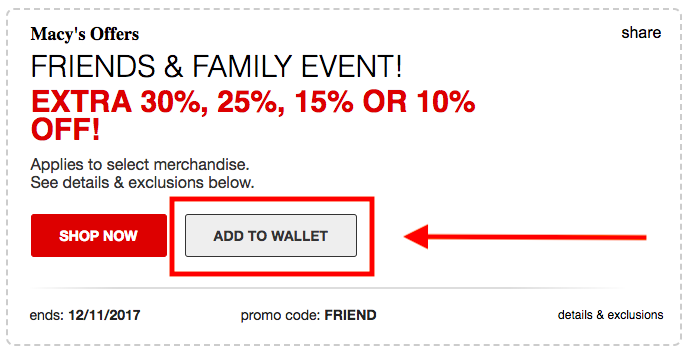 Plus, now you can save deals to your wallet, so you can save & checkout in a few clicks! It tells you everything you need to know about an individual sale: how much you’ll save, when it expires, code to use and all pertinent deals and exclusions. It allows you to add the deal to your wallet immediately. That way, you eliminate the chance you’ll checkout and forget to add a promo code to your order. If you haven’t signed in yet and try to click “Add to Wallet” without having a free Macy’s account – or haven’t signed in yet – it will automatically redirect you to a page to either create an account or sign in. 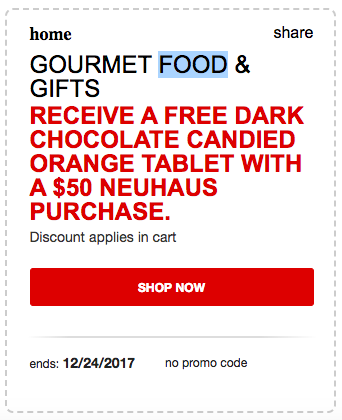 I might not even have thought to shop in the gourmet food and gifts department if not for this deal. The other benefit of some of these deals is that they often last far beyond the bigger sale promo codes you’ll find listed on the home page. 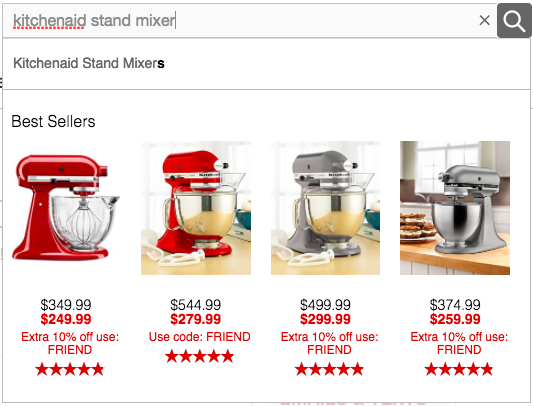 As you type in your search, you will see best sellers and recommended products, along with their current price and any additional discount codes, but it doesn’t always give you the full picture. If you recall, our original search was for KitchenAid Stand Mixers. 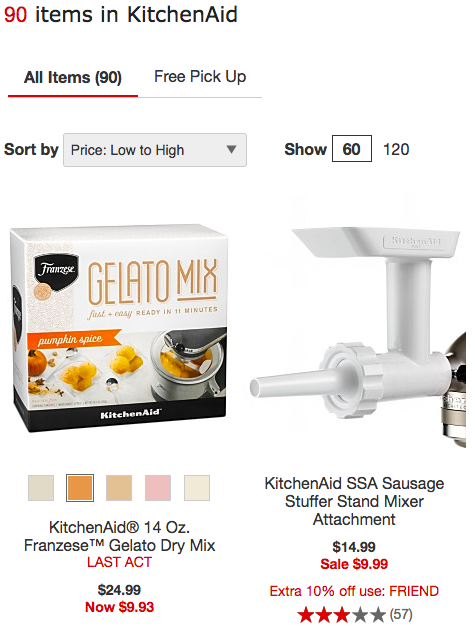 Obviously, the first two search results in the image above are not mixers themselves, but rather accessories/mixes to use with it. 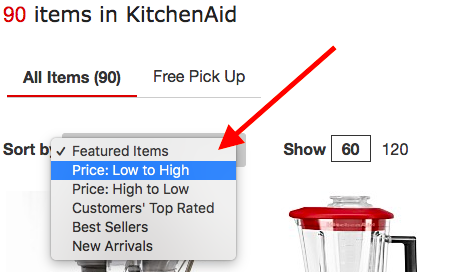 You can always scroll to find the lowest priced item that matches your search, or you can further refine your search. Either way, you’ll find the lowest price-point of whatever it is you’re looking for and you just might find another great deal to go along with it! One of the easiest ways to maximize your Macy’s online shopping is to scroll down on whatever product page you find yourself on until you reach the Price widget. 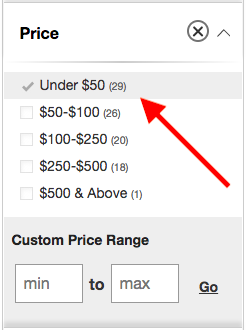 With this price tool, you can filter search results either by a pre-determined price range, or you can determine your own custom price range. Even before you make your selection, you can see just how many items are offered in each price range. Hopefully these seven tips have taught you how to save even more shopping online at Macy’s. When you recognize and utilize all the tools available to you right on Macys.com, you’ll become an even savvier Macy’s shopper!